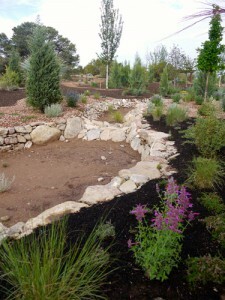 In the Santa Fe Botanical Garden at Museum Hill, there exists a beautiful, meandering stone creek bed to slow the flow of rainwater and retain it for nourishing plants and trees in the Orchard Garden. We refer to this feature as La Rambla and it is an important tool in storm water management, erosion prevention and to encourage groundwater recharge. Summer monsoons and large storm events can result in flash floods and devastating erosion to the landscape and into the arroyos. 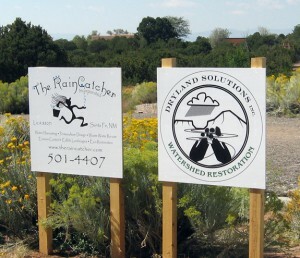 Soon after the construction and planting of the Orchard Gardens, the design was put to the test and successfully proved to harvest the water and slow the flow through the system of Zuni Bowls. See the slideshow below take on July 19, 2013 by Reese Baker from The Raincatcher. About The RainCatcher Inc. and Dryland Solutions Inc.
Water conservation and catchment design and implementation was led by two local businesses, The RainCatcher Inc. and Dryland Solutions Inc. in Santa Fe. A long rock-lined drainage swale begins uphill of the garden and continues through the Meadow Garden area, continuing through drain pipes beneath the Central Walkway, feeding into a series of Zuni Bowls stepping down the arroyo bank. The swale features a number of infiltration basins along its length that will encourage water to pool and ultimately seep into the soil. Step pools will slow the flow of water as it approaches the ponding area called the Veronica Pool sculpted into the Meadow Garden. In some areas gravel mulch will serve as flow collectors to encourage infiltration. The entire length of the drainage swale was seeded with Sheep Fescue at the time it was installed. The grass will soften the appearance of the rockwork. Over time these structures will virtually disappear into the fully mature garden, but will continue to function as designed. Want to receive the lastest news? Join our enews mailing list!